This is a summary of what I did to avoid manually removing 28 different packages using the long form name of them without access to Powershell in the Windows RE. This worked better than using DISM to revert pending actions or deleting “pending.xml” but takes a little additional prep work before running the script. Boot into the Windows RE from an ISO and launch into the command prompt recovery mode. In order to resolve a failed relationship between a FortiGate and FortiManager we needed to remove the FortiGate. In FortiManager this worked fine, however in FortiGate the relationship still persisted (under Security Fabric -> Settings -> Central Management). 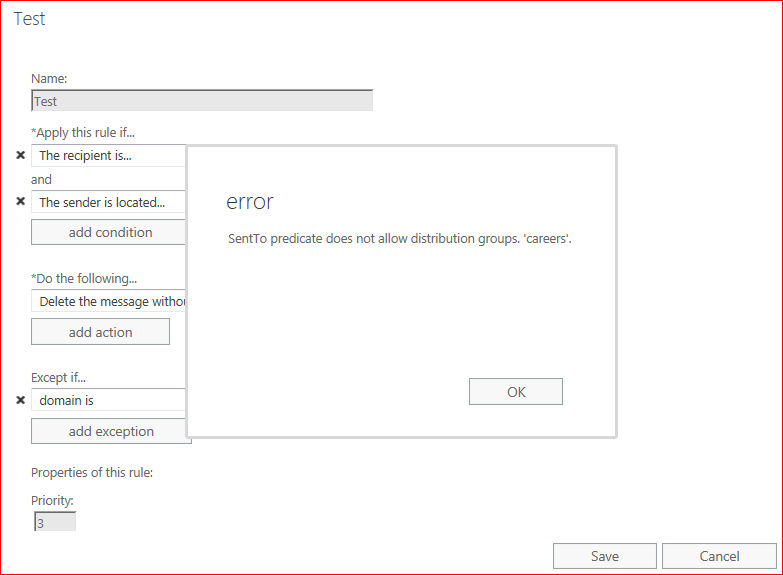 SentTo predicate does not allow distribution groups. ‘My Group’. On the pre 4000 series ISRs you would use the regular Cisco escape sequence to exit a service module — CTRL-SHIFT-6 followed by X. In the 44xx and 43xx series routers the switch modules do not respond to the regular escape sequence from the console. Instead, to escape back to the router console use — CTRL-A followed by CTRL-Q. Brian Scheewe on Speed up mailbox migration to Exchange 2013 – They’re too slow! Michel de Rooij on Speed up mailbox migration to Exchange 2013 – They’re too slow!